Published by Elsevier in association with the International Ship and Offshore Structures Congress. 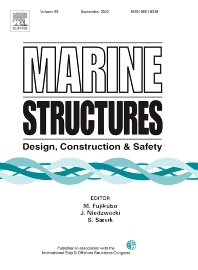 This journal aims to provide a medium for presentation and discussion of the latest developments in research, design, fabrication and in-service experience relating to marine structures, i.e., all structures of steel, concrete, light alloy or composite construction having an interface with the sea, including ships, fixed and mobile offshore platforms, submarine and submersibles, pipelines, subsea systems for shallow and deep ocean operations and coastal structures such as piers. • Fabrication, launching, installation and decommissioning techniques. Papers submitted to the journal must be original and will be refereed to a high standard. They may include new research findings, together with developments in design methodology and fabrication techniques. Priority will be given to papers which are likely to have an impact on design. Constructive state-of-the-art reviews are also welcome. The journal will also include technical notes, discussion of papers, invited commentaries, letters to the editors and reviews of significant new publications in the field, together with a calendar of important events worldwide.